Gunners legendary winger Robert Pires has praised the club’s new signing and former team mate Santi Cazorla, admitting he attempted to persuade Arsene Wenger to sign the player two years ago. Arsenal were linked with the Spanish international last summer, however he remained in La Liga and switched to Malaga. He was then influential last season in the club’s Champions League Qualification. The move ended up being beneficial for Wenger as he was able to get the little Spanish maestro on the cheap – believed to be around the £15m mark as Malaga suffered financial issues. The 26-year-old has been in fine form this season and has been the main creative force in the engine room for Arsenal. Pires, who played with Cazorla at Villarreal before he left the club in 2010, has said he always knew he would fit in well at the Emirates, and urged Wenger to bring the midfielder to North London on several occasions. Cazorla is a great player. I noticed him immediately and saw him growing as a player in Villarreal; today I’m happy he is at Arsenal at last. He is a player who fits well into Arsenal’s style. I gave an interview after he had joined us in a few training sessions [for Villarreal]. Some Spanish journalists asked me who is the player you like? My answer was there is one who you don’t know which foot is his best: it’s Santi Cazorla. I have been telling that to coach [Wenger] for two years. I considered him as the ideal player for Arsenal. The former French international then went on to say he would have loved to see fellow compatriot Hugo Lloris join the Gunners and another striker to supplement Giroud, however he believes Arsenal’s new striker needs time to settle and he will become an Arsenal star, citing fellow legend Henry’s adjustment period. Fans should remember Thierry Henry when he joined Arsenal. He didn’t score much before becoming an icon of this club. Fans should be more patient with Giroud then. It’s never easy to switch from one football to another one, from one culture, one language to a new one. I’m sure he will come stronger and stronger. Pires’ praise of Cazorla is certainly justified. He was THE bargain of the summer and is one of Wenger’s most astute signings in recent years. He has gone a long way to fill the ‘fab-gap’ left by his compatriot Fabregas two summers ago and is a real driving force in the Arsenal attack. His ability to use one foot as well as the other helps in tight situations which helps to influence his quick pass and move style, and hopefully he will add more goals to his game this season. The Gunners will once again look to the Spaniard to produce the final balls and break down the United defence for Arsenal’s wingers and strikers, but with Wilshere’s return some of the pressure will be taken off the attacking midfielder’s shoulders. The Englishman produced a strong outing last week at the Emirates and the duo will prove to be a real test for United’s midfield and backline. In terms of striker choice against United, Giroud’s selection seems a given with Gervinho injured and Walcott likely to be benched after playing a full 120 minutes at Reading in midweek. He has been impressive in recent weeks and is the perfect player to play the lone striker role as he is strong in the air , solid on the ball, and can hold up play, distribute well and he can finish. But like Pires said, the goals will come for the Frenchman and to score against United will be a great way to get the ball rolling once again. What are your thoughts on the acquisition of Cazorla? Do we congratulate Pires for his ‘involvement’ or is he just jumping on the bandwagon after the move worked out and the Spaniard has since produced superb performances? 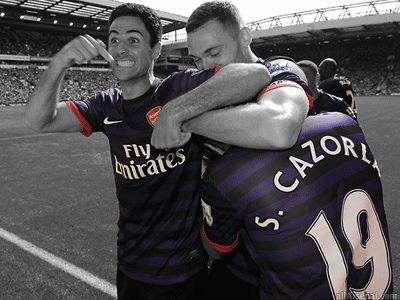 Feel free to comment below or in the allarsenal forum under Cazorla’s thread.